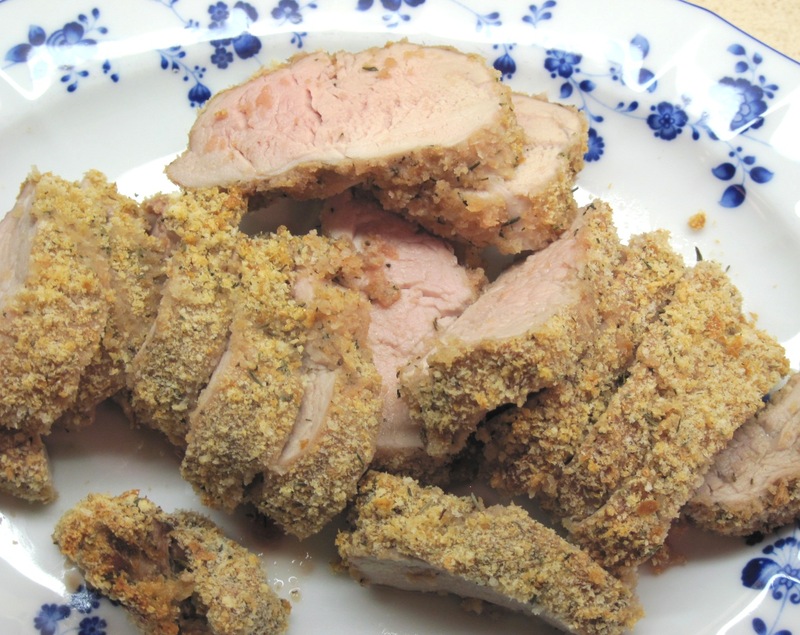 Pork tenderloin is a very lean cut of pork that can be prepared many ways. 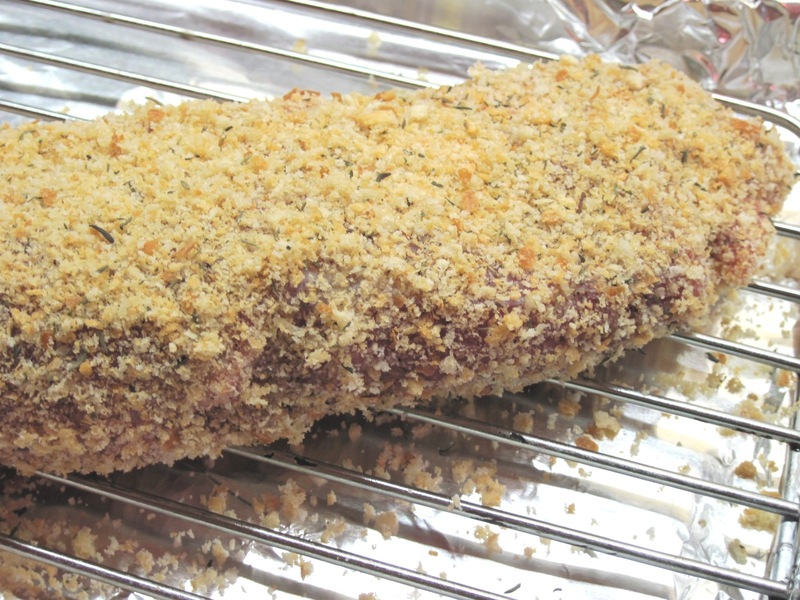 Last night I tried a new recipe from Cooking Light for “Thyme-Coated Pork Tenderloin”. It was quite good, but I think the recipe needs some “tweaking”. Next time I might try using a small amount of mustard instead of the egg whites to give a flavor boost. I’d use fewer bread crumbs. Or I might skip the bread crumbs altogether and use a flavorful rub. This is a recipe you can play with. Many people end up overcooking pork “to be safe”. The only way to really know if pork is done is to use an accurate meat thermometer. The USDA says it should be 160˚ for safe eating; they also say that the meat could be pink and still be done. My pork tenderloin reached a temperature of 165˚ so it was done, even though it remained slightly pink. For tender, delicious pork use a meat thermometer. If you cook it until it is grey throughout you’ll have tough, overcooked meat. Update 9/18/11: The USDA has revised the recommended cooking temperature for all whole cuts of meat, including pork, to 145 °F. They now advise cooking whole cuts of meat to 145 °F, and then giving them a 3 minute rest period. All poultry and all ground meats should still be cooked to 165°F. You can read the update here. 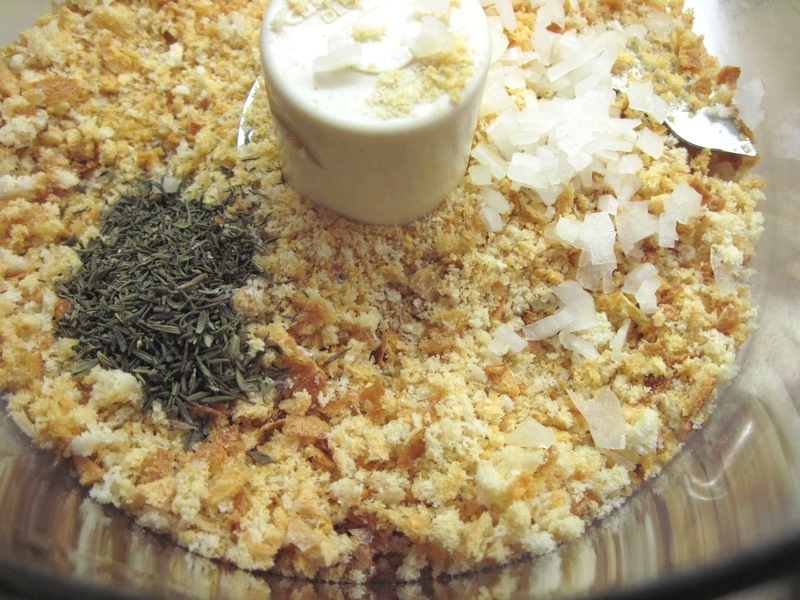 Put the bread, thyme and onion in a food processor and pulse until you have fine bread crumbs. Put the bread crumbs on a plate. Sprinkle the pork with salt and pepper and dip it in the egg whites (or cover it with a thin coating of mustard). Press it in the breadcrumbs. Put a light coating of oil on a broiler pan or a rack in a baking sheet; place the coated tenderloin on the broiler pan or rack. Bake at 400˚ for 30 – 40 minutes, or until internal temperature at the thickest part is 160˚. Let stand 5 minutes. Cut into ¼-inch slices and serve.